Front end development. CMS wrangling. Crying yourself to sleep. Well, this was a tough one to negotiate. 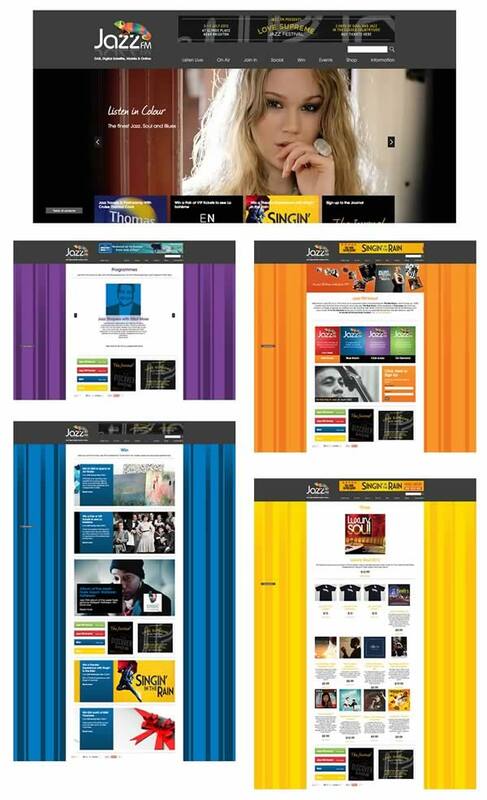 Jazz FM wanted an overhaul of their site circa 2013. Ordinarily I have some input into how things look, but I was very much on nuts and bolts duty with this one. Well, the CSS / CMS nuts and bolts. Nuts and bolts lite, maybe. It’s fine. I can do that. No, honestly, it’s FINE. Anyway, aside from me and obviously Jazz FM themselves, there was a London based agency (doing the design. Which is normally what I do. As I say, IT’S ABSOLUTELY FINE) and an American based company (responsible for the hosting, CMS and all the rest of it) in the mix with this one. The former did the page layouts, sectionals, how it should all look and work and that, which then got passed onto the Americans to slice up and integrate into their CMS. My job? Run with it from there, iron out any issues and start populating the site with content. Within that, use my knowledge and / or expertise to communicate with the Americans to fathom out the solution(s) to any teething problem(s). If it weren’t for the support of someone over there (actually a great bloke who I had dealt with before who was in a pretty unenviable postion – he knew the shortcomings and was very sympathetic and diplomatic about it all), the whole thing never would’ve got finished. In the end I think it went up three months later than originally planned. It was insane. Rather than using a conventional coding language, they had invented their own, with barely any documentation; it was like walking down a blind alley into a new dimension. You couldn’t even search for solutions elsewhere on the internet, as the thing wasn’t open source and used its own coding conventions. Normally in these write ups I try and have a bit of a laugh with it, but for this one I’ve got nothing. You know The Cormack McCarthy book ‘The Road’? This is my own personal version of that. I still do stuff regularly for Jazz FM and they’re all lovely people to work for. All of the above has now been addressed and their site has now thankfully risen phoenix-like from the ashes and is on a respectable platform.